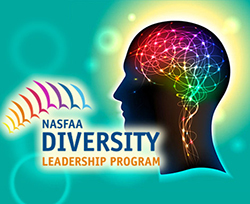 NASFAA’s Diversity Leadership Program (DLP) provides selectees from a wide range of diverse backgrounds with a robust portfolio of benefits, mentorship, and guidance on how to develop as a financial aid association leader at the state, regional, and national level. Applications are reviewed annually and six institutional members of NASFAA, one from each region, are selected by a group of their colleagues. The program, unveiled in 2018, was developed through extensive conversations with NASFAA’s Diversity Officer, the NASFAA Board of Directors, and regional association leaders. provide individuals from identified under-represented groups in the association community (i.e., people of color, lesbian/gay/bisexual/transgender people, people with disabilities) with support, access, and opportunities for leadership. Hold a place on one task force for each participant within the July 1 to June 30 year of service, to ensure volunteer experience. One program participant per region will be selected each program year, for a total of six selectees annually. Be employed by a current NASFAA institutional member. Secure in writing supervisor/institutional support for the individual’s participation and time away from the office to participate in DLP.